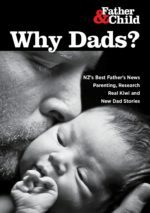 Posts tagged with "teen dads"
Father and Child Trust’s Brendon Smith presented at the AAIMHI Conference “And father makes three; family inclusive practice” on Oct 29-31 at UNSW in Sydney, Australia. The NZ Herald on Sunday mentions Father and Child Trust, along with Thrive Teen Parents and Great Potentials Foundation. The article was about a teen dad who has fathered thirteen children, not much is known about his level of involvement. Brendon was interviewed for a story on teenage dads published in the Sunday News last weekend.